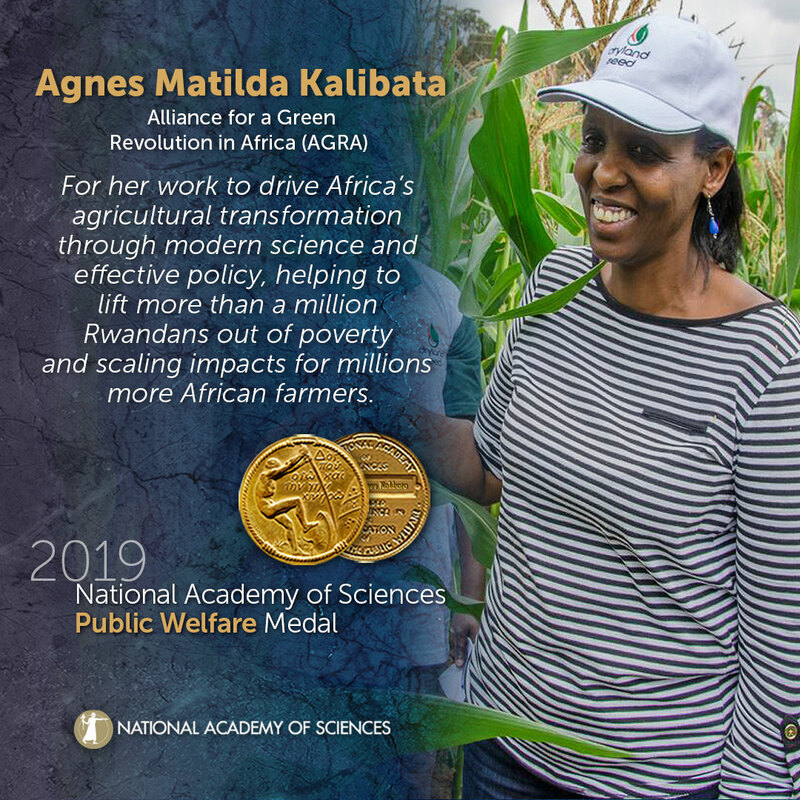 Agnes Matilda Kalibata is a Rwandan agricultural scientist and policymaker credited with helping lead an agricultural transformation in Rwanda as minister of agriculture and animal resources (2008-2014) and president of the Alliance for a Green Revolution in Africa (AGRA). (2014-present). The National Academy of Sciences is honoring her with its most prestigious award - the NAS Public Welfare Medal, which is awarded annually to a scientist using science for the public good. We’re honoring her with a WiSE Wednesday profile and her own Wikipedia article! Kalibata was born in Rwanda and raised as a refugee in Uganda to parents who were smallholders. She earned a bachelor's degree in entomology and biochemistry, followed by a master's degree in agriculture, both from Makerere University in Uganda. She then earned a Ph.D. in plant, soils, and insect sciences from the University of Massachusetts Amherst. After carrying out research at the Kawanda Agricultural Research Institute with the International Institute of Tropical Agriculture, she took a position as Rwanda's minister of agriculture and animal resources. Throughout her tenure (2008-2014), she promoted the use of science-based approaches to agriculture to increase food production and improve food security, with a focus on family farmers. She implemented policies designed to connect farmers with neighbors and customers, as well as cooperative farming programs, and cow-sharing programs that made it easier for families to own cows.In the six years she was minister, Rwanda's poverty level dropped more than 50 percent; its agricultural sector's annual budget grew from under $10 million USD to over $150 million USD. Since September 2014, she has served as president of the Alliance for a Green Revolution in Africa (AGRA), an African-led organization whose mission is to improve the food security and incomes of 30 million faming households in 11 African countries by 2021 by, among other things, providing access to better seeds and credit. Kalibata has been instrumental in advocating for gender equality in Rwanda, emphasizing the economic benefits of encouraging women to play a more public role in society as Rwanda recovered from the 1994 Rwandan genocide that killed 800,000 people in three months and left Rwanda's population 60% female.